I took this in a dark lot at the intersection of three busy streets. It was late, nearing 11 pm and only Zip accompanied me. I’ve stayed off of social media a lot more these days. Karen and I had just finished our evening coffee and we were about to walk the boys. Something prompted me to look at Facebook. Right away I noticed a friend on the east coast had tagged me. Lost borzoi in Salem posted by Northern California Borzoi Rescue. I had spoken to Nancy a few times over the years and I called to see if I could help. So appreciative, she enthusiastically said yes and gave me the contact number of the Jeffrey’s foster parents. I’ve been on four lost dog searches over the years. All greyhounds. The first was our own dog, Blender. A spook and it was the fourth of July. Karen and I had just become friends and we all set out to find Blender. Somehow by luck, we spotted her about 1.5 miles from the house running frantically across the street. I remember flagging a car down to give me a ride so that I could get closer, before she got to the intersection of Lancaster and Silverton. An intersection where no dog was a match for the cars that sped by. I got ahead of her and walked back to the field. I’ll never forget the look on her face when she looked up at me, ears poised and happy to see me but still to afraid to come up to me. I got her home safe and sound. Another greyhound was loose for 11 days. Her last sighting was in a field miles from where she escaped. Every night without fail Karen and I went out to the field to take her fresh food and water. The third greyhound was never found, but there were drops of blood on the doorstep. We will always wonder what happened to him. And that brings us to Jeffrey. Our first search for a dog with the help of social media. The help we got searching was amazing. Salem has a Facebook page for Lost and Found Pets of Salem. They are amazing. 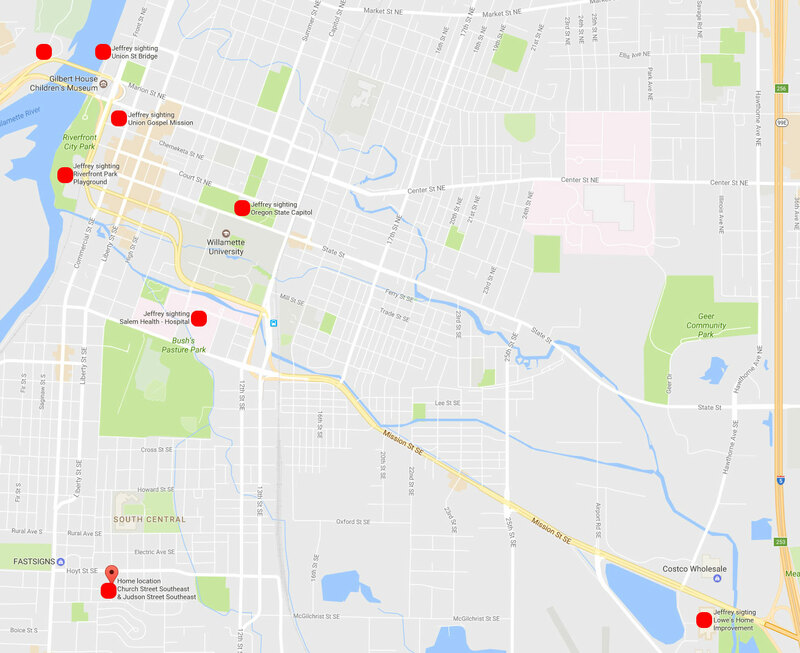 People posted sightings of Jeffrey from the time he got loose at about 1:30 pm. At least that gave us places to start. In a short time, that boy traveled an incredible distance. He got loose at the lower left corner dot. From there he headed east to Lowe’s. They thought they had him cornered and he escaped. Karen and I started walking with Zip around the State Capitol and got a call that someone had just seen him at the Riverfront Park. Without the call, we may have stayed around the Capitol. We spent a long time at the Riverfront, finding an opening into the construction site and nothing. We decided to head home and wait for another sighting. We hadn’t been home five minutes when a call came in for the hospital. Karen stayed home to take care of our dogs and Zip and I hopped back into the car. Just as we reached the hospital, another call came in that he was sighted by the Union Gospel. At this point, I questioned the timeline and thought maybe he had just been heading north the entire time. I drove past Union Gospel and turned down a street that borders a park. Construction workers confirmed that they had just seen him and he ran across the pedestrian bridge into West Salem. We called the foster parent and told him to head to other side to the park and Zip and I started walking across the bridge. When we hit the fork in the road, I thought like a dog and went straight, toward one of the busiest intersections in West Salem. We got to Wallace Rd. and had no idea where to look. We paused for awhile. Checked in with Karen and then, lying in the grass about 20 feet away was Jeffrey. He had the same look as Blender, so glad to be found. I, on the other hand sat down where I stood and called borzoi rescue. Nancy called Paul, the man that had transported them to their foster home from Washington. When Jeffrey got up and started to walk toward the street Zip and I hustled out and around to keep him in the greenway and Paul arrived within seconds. He gently knelt and offered Jeffrey some chicken. I cried like a baby when he was able to attach the leash to his collar. So many things went right with a situation that could have been catastrophic. The help of social media was invaluable. That borzoi traveled such great distances, including across the Willamette River, that without the help of Lost and Found Pets of Salem, we certainly would not have gone to bed knowing he was safe. Many people had tried to approach Jeffrey and he bolted every time. By following his trail thanks to the people that let us know when they saw him, we were able to contain him until someone he trusted showed up. It was almost 11 pm when we all breathed a huge sigh of relief. I am so grateful to every one that helped. Thank you from the bottom of my heart. 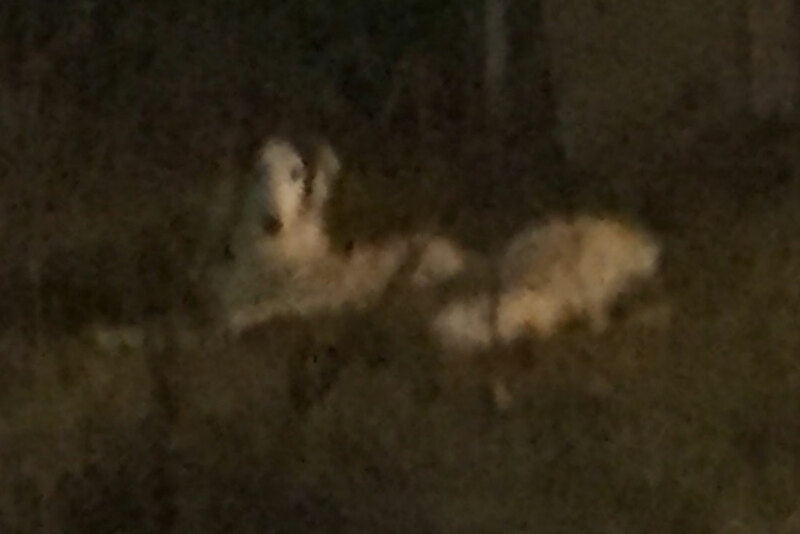 This entry was posted in borzoi and tagged lost dog.